Every year the celebrations of Maghi Mela at Muktsar during the month of January are one of the most important Mela – Fair– of India and the most important of all religiously significant gatherings of the Sikhs. Not making here also the political discussions at the start of write-up, let me first share the significance of the Maghi Mela - the Maghi fair is held to honour the memory of the forty Sikh warriors killed during the Battle of Muktsar in 1705. Muktsar, originally called Khidrana, was named as Muktsar - the pool of liberation - following the battle. These forty Sikhs, led by their leader Mahan Singh, had formally deserted Sri Guru Gobind Singh in the need of hour, and signed a written memorandum to the effect. When Mai Bhago, a valiant and upright lady, heard of this cowardly act, she scolded the Singh's and inspired them refresh with spirit of bravery for which Sikhs are known. Hence, the unit went back and joined the Guru who was already engaged in action at Khidrana. All forty of them attained martyrdom. The memorandum (bedawa) was torn-down by the Guru himself just before Mahan Singh died. The Shiromani Akali Dal who is already enjoying the ruling status in Punjab as ‘sworn alliance’ with the Bhartiya Janata Party (BJP) for the second consecutive term has claimed to form its government for the third time. 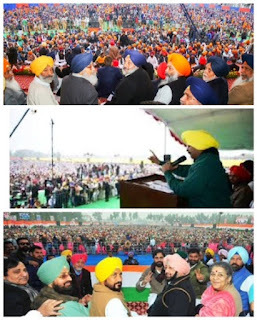 Perhaps, the senior Badal who is in his 90s, saying that it will be his last term and appealing to the people not to follow the already tried party –Congress and outsider –AAP a party of rejected leaders. But the more surprising factor at the Maghi Mela was the missing of BJP leaders despite claiming of cordial relations with SAD as its alliance partner in Punjab. Except for Health Minister –Surjit Kumar Jyani, not even a single local and state level BJP leader was present on the occasion. However, Congress under the tutelage of Capt Amrinder Singh is seen at one platform which is clear sign of contesting the coming elections with full hope to form the government in Punjab. After a massive mandate in Delhi, Kejriwal looks for AAP's victory in Punjab where the party had secured four Lok Sabha seats in 2014 General Elections. Aam Aadmi Party convener Arvind Kejriwal has began his poll campaign in Punjab attacking both Akalis and Congress and asked people to vote for AAP to end “corruption, drug abuse, farmer suicides” and put the state back on “right track”. At Maghi Mela- Kejriwal was a show-stealer on his first public outing in poll-bound in Punjab where the turnout was more than expected. On the other hand, it has now become official for Peoples of Party of Punjab (PPP) launched by Manpreet Singh Badal with his announced of merger with the Congress to give a fresh boost especially when the Assembly 2017 mission is approaching fast, with a triangular contest among SAD-BJP (so far), Congress-PPP and AAP. Manpreet Singh who himself don’t want to suffix ‘Badal’ with him, of which the people are scared, is a promising face, secular in character and definitely hold the credibility in the Malwa region. Despite the fact he has been a member of Punjab Legislative Assembly from 1995-2012, he could not get a single seat in 2012 Assembly elections, including himself to establish his identity. But his quitting from the Badal’s where he was enjoying the portfolio of Finance Minister, following difference within the alliance over reported debt waiver offer from the Centre and was at loggerheads with Dy.Chief Minister Sukhbir Singh Badal. 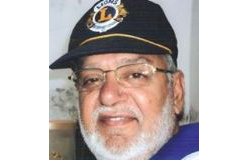 He has been a member of Punjab Legislative Assembly from1995 to 2012 and served as Finance Minister. Frankly speaking, it is in fact more political mela than the religious celebrations to show strength of the party in view of the coming Assembly elections during 2017. There had been three different political conferences where show of strength was more important. It was a single line tribute to forty Sikh warriors killed during the Battle of Muktsar in 1705 and rest of the speeches were full of charges and counter-charges to pursue the audience to make a vote bank with number of promises which always prove to be false later on and the people cry for the services for full five years’ term with a hope to turn the tables in the next elections. The move of PPP to merge with Congress is to get rid of the ruling Shiromani Akali Dal and the Badal family. The BJP is still in decisive in Punjab about keeping alliance with the SAD and absence from Maghi Mela has raised a number of questions for the leaders and voters as well. It looks that the BJP was least interested in this event and had not mobilized their workers for the same right from the announcement of celebrations. The elections in Punjab will definitely be triangular among SAD jointly with BJP, Congress in alliance with PPP and AAP.